A bed of 4" or more of crushed/screened 3/4 minus gravel or other porous gravel is required for all sheds over 8' wide. Gravel base is to be 2 feet larger than the shed size. 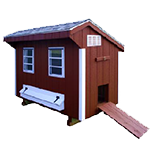 Example: 10x12 shed requires 12x14 base (see diagram below). 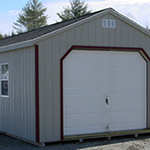 Although a level gravel base is best for your shed, buildings 8' wide or less can be set on additional skids running the width of the building. 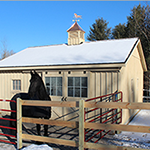 Hill View Mini Barns can provide those for a low additional fee. If your building site can't be accessed with our truck and trailer, we have a machine called a 'mule' that can get in around corners and between objects better than a truck and trailer. Occasionally, the site location is remote and can't be accessed by truck or by using the 'mule'. 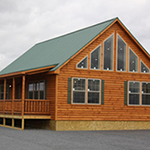 In those cases, we may be able to prefab the walls, floor, and roof and carry in the pieces. 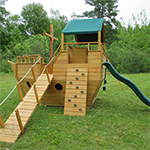 The cost is higher if we need to go on-site and do an assembly like that. If you have any questions, please talk to a salesman to discuss the delivery and set up possiblities. Using a straight edge or line level, make sure the gravel base is flat, not racked or twisted. If you're doing a base for a camp with plumbing, you must have an access hole built into the base where you can do the plumbing hook-up. Please consult with a salesman for the proper location. 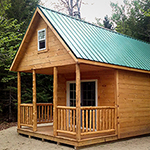 The integrity of the shed depends on the quality of the base. 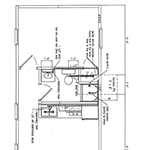 The following diagrams show the layout of the typical 4"x4" skids. This is not for the 6"x6" upgrade option that we offer. 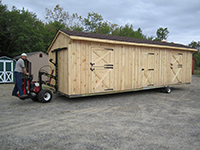 How are the storage sheds and barns delivered? 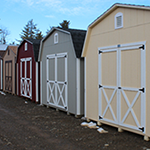 Most of the storage sheds and barns come to your site pre-built and ready-to-use. On some of the larger barns and camps, there is on-site work that needs to be done. Most of the buildings are placed directly on a gravel base or slab. 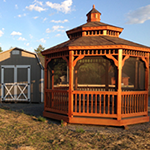 To save costs, small storage buildings (8'x8' to 8'x16') can go on an extra set of sleepers rather than a gravel pad. 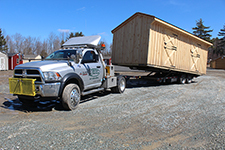 We deliver the buildings with a specially built trailer. 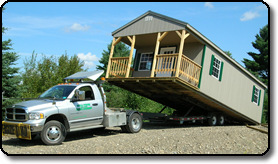 The bed of the trailer tilts and has various adjustments so that the building can be placed precisely where you want it. After backing up to the gravel base or slab, the trailer is tilted until the back of the shed touches the ground. The driver then carefully drives the trailer out from under the shed. 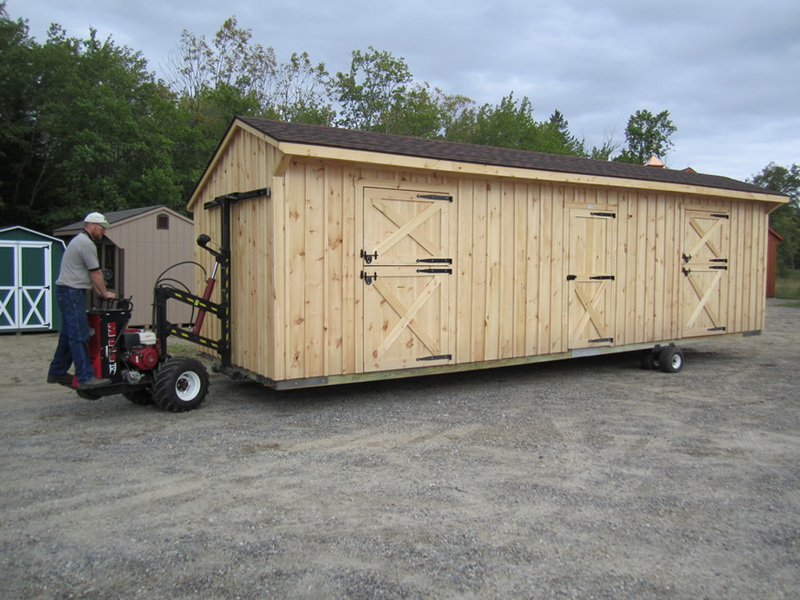 If you have an area where you'd like your building, and the truck and trailer can't get in, we have a piece of equipment called a "Mule" (please see photo at the top of page). The mule can get into tighter spaces than the truck. Please discuss your delivery location with us ahead of time. There needs to be sufficient space to drive in to where the building is placed. Please have at least two feet more than the building width and 14' in height cleared for a straight delivery- more if we need to take corners! Please feel free to contact us if you have special requirements, and we'll be glad to answer your questions. Also see the "Before you Buy" page for additional information. 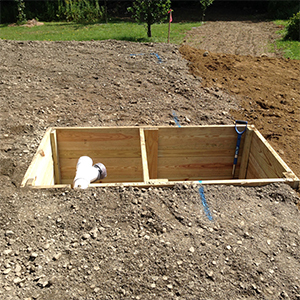 The 'Pit' for camp water hook up. This is the best way to get your water/sewer hook up in a camp when you're setting it on a gravel base. The box and pipes must be flush to the ground. The pit extends under the building as well as outside the building. You then have access to the plumbing going into the building and your connections can easily be made and maintained in the future. For more information please click on the photo and sample pdf. One of the salesmen would be glad to talk to you about the details.